On Monday, a remarkable thing happened. Our family friends, Hunter and “Boo” Steele, are avid collectors of second hand books. Each time they visit my in-laws on Mull they sweetly bring a selection of volumes for Alexander and me. These books arrive in a large cardboard box, wrapped in bright paper and signed off with kind wishes. When you open up the package, that special old book smell wafts out like nostalgia. My contents of my box always have a distinctly avian theme – eagles on this occasion (Hunter and Boo are excellent at keeping up with our latest interests and career developments). Mixed in with the others was one titled “The Manual of British Birds”. It was a handsome pale green, with pages that looked slightly out of kilter in a very satisfying vintage fashion. It wasn’t exactly a pocket guide; in the wrong hands, it could have knuckle-dusted its way through the liveliest Glaswegian bar brawl on a Saturday night. I turned to the front of the book to see when it was published – third edition, late 1920’s. It was only then that I noticed the name and address, neatly written on the inside front cover. I blinked a couple of times, and read the name again. But if I told you that here, in my lap, was a book that belonged to one of the greatest ornithologists and conservationists that Britain has ever seen, you might begin to understand my delight. When Mr Waterston acquired this book – taking the trouble to add his name and address in carful fountain pen ink, he was just twenty-four years old. I have seen photographs of George at this time. He looked like the sort of man that smiled a lot, with a generous pair of eyebrows and very twinkly eyes. My father in-law actually knew George – who was a friend of his own father, and visited their house in Edinburgh. He describes him as an energetic and vital man. When this picture was taken, Waterston couldn’t have known that ahead of him was involvement in the Second World War and subsequent capture by German forces as a POW. He couldn’t have guessed that he would be instrumental in the protection of Britain’s first returning ospreys, following their extinction from our isles as a breeding species in 1916. 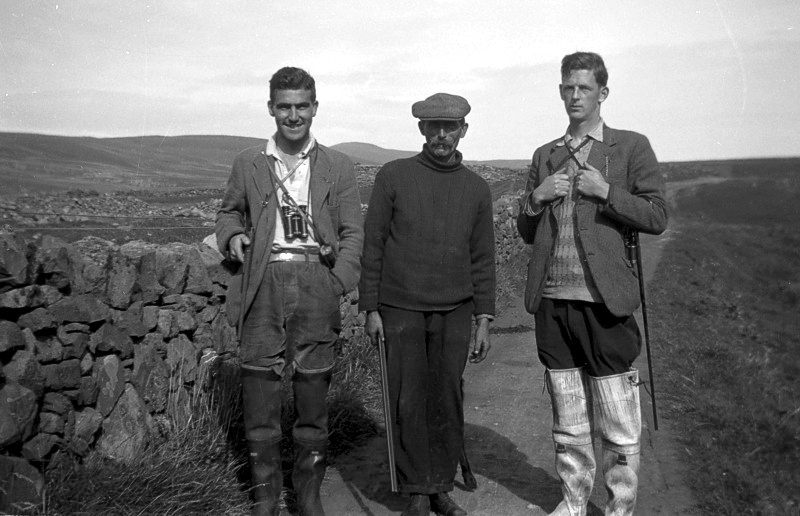 He probably hadn’t yet thought about buying Fair Isle and setting up its internationally acclaimed Bird Observatory in 1948 – though he had visited the island for the very first time in 1935, the year that he bought the book. And perhaps, most importantly to me, George hadn’t yet imagined bringing young white-tailed eagles from Norway and releasing them first in Argyll and then on Fair Isle, with the sprouting intention of restoring this majestic species to our skies. He was so loved by the island people for his interest in both their natural and cultural heritage, that there is now a museum on Fair Isle named after him. Holding his book and feeling the vertigo of gazing back through an unknown mans life, it struck me what a fabulous coincidence this was. 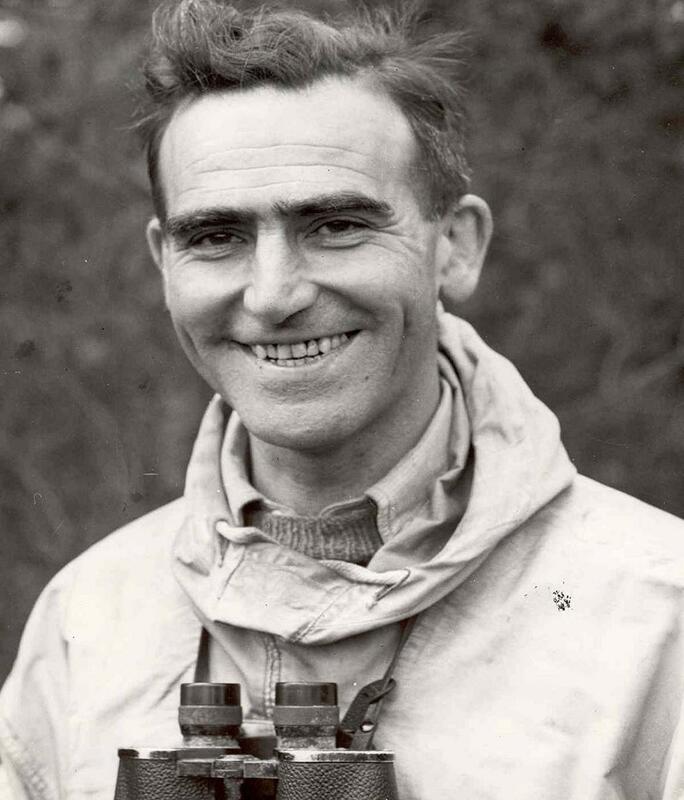 I first came to know about Mr Waterston when I worked at the Loch Garten Osprey Centre, part of the RSPB’s blue-chip Abernethy National Nature Reserve. George was one of the founding members of the Scottish Ornithologists Club, and later became Scottish Director for the RSPB. The swashbuckling story of how the first returning ospreys were protected from the depredations of egg collectors – and eventually, raised to celebrated status when the public were invited to view them at their nest – is one that I told often. George was pioneering in his desire to welcome the public and share the excitement of such special sites. He was also quick to understand that doing so effectively increased the level of protection for the birds, and minimised disturbance elsewhere as they slowly regained their ancestral haunts. During that first summer in 1959, fourteen thousand guests came to view the ospreys. Since that time over two million others have followed suit – and that’s just at Loch Garten. How many people, then, have been touched by the manifold splendour of our natural world because of this man and others like him? Later today, I am meeting a group of guests to show them the family of white-tailed eagles that I watch. Their chick fledged last week and is taking his first faltering flights around their territory. This eagle family is one of twenty breeding pairs on Mull, and over one hundred others across Scotland and Ireland. The spectacle of “Hope” (our magnificent resident female) thermalling with all the swagger and innate confidence of a native in her homeland, is a sight that I think would have pleased George. With special thanks to John A. Love whose excellent book “A Saga of Sea Eagles” [ISBN: 978-1-84995-080-0] helped to fill in some of the gaps for this blog. I am smiling ear to ear at your joy and pleasure in what this book means to you. What a wonderful story, thank you for sharing. Thanks for the lovely comment, Andrea! 🙂 Yep- it was a very special moment. What a lovely moment of serendipity! And what a place Mull is. My wife and I just returned to Edinburgh after a few days on the Island and were lucky enough to see 2 Sea Eagles, even spotting one from the bus as it flew overhead at Bunessan. It had a yellow tag on its left wing. Beautiful!